While looking around at the SL7B, I came across an exhibit near the auditorium with a Coast Guard helicopter and a few vessels. Upon closer inspection, they read Second Life Coast Guard. One of the sailors was nearby, a neko with a parrot on her shoulder, Chakku451 Rieko. I had a talk with Chakku about what the SL Coast Guard does in the Metaverse. 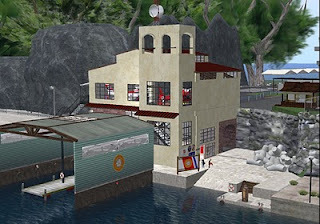 Bixyl Shuftan: So how big is the Coast Guard in Second Life? Chakku451 Rieko: Well, there are several Coast Guard groups in SL, like there are several police groups. The SLCG is not an official arm of Linden Labs, nor do we act as law enforcement. Bixyl Shuftan: Where was your particular Coast Guard group? Chakku451 Rieko: We're quite active throughout the SL waterways. My particular station is in Kirkstone. Bixyl Shuftan: Was there just one ship there, or a few? Chakku451 Rieko: We have one cutter belonging to the station commander. The boat commanders get a Defender class patrol boat and an Atlantic class RiB boat for patrols. Our air wing uses Dolphin class helicopters. Bixyl Shuftan: What kinds of missions do the ships go on? Chakku451 Rieko: We provide courtesy patrols and escorts for sailing events and do patrols to check for prim litter and navigation hazards throughout SL. Bixyl Shuftan: Prim litter? Is it mostly just a nusciance? Chakku451 Rieko: I usually find boats washed up on the shore after the owner has crashed during a sim crossing. Seems like most of my boating excursions end with me standing on the seabed with an upset parrot on my shoulder. Bixyl Shuftan: Heh, the idea of a pet bird is nice. Chakku451 Rieko: Thank you. Sansara can be a handful at times. ... I acquired him from a pirate. Bixyl Shuftan: Oh? How did that come about? Chakku451 Rieko: My RL brother was an independent pirate, meaning he didn't belong to a group. He gave me Sansara when he left SL. ... Let's just say he has a sailor's vocabulary. Sansara : Hey! I'm the bravest parrot on the Grid. Bixyl Shuftan: (chuckles) I take it there are also some RP (roleplaying) missions? Chakku451 Rieko: We don't RP so much as offer assistance. We do the occasional demonstration, but for the most part we try to help out any boaters having issues. Bixyl Shuftan: Have there been any incidents that stand out from others? Bixyl Shuftan: Women who wanted to be taken by pirates? Chakku451 Rieko: They were really nice about avoiding the race route. Yes, I believe that's what they were looking for. Bixyl Shuftan: Did you do anything about them? Chakku451 Rieko: There wasn't really anything I could do. It was a mature sim and they weren't really causing any trouble. I gave them a copy of the race route and asked them to try to avoid getting in the middle of a race, which they readily agreed to do. ... Oh, my rank is Command Master Chief. Bixyl Shuftan: The highest enlisted rank? Chakku451 Rieko: Yes, I'm the Executive Officer of Muirhead Station. So I'm CMC (there). Bixyl Shuftan: How long does it usually take someone in the SL Coast Guard to rise in the ranks? Chakku451 Rieko: It depends. I was offered an officer rating when I requested to be assigned to Muirhead Station, but expressed a preference to remain in the enlisted ranks. Chakku gave me an LM of Muirhead, as well as a notecard with a little information, and we bid each other farewell, and went our separate ways. I later went to the station, and found it to be well detailed, both the equipment and vessels. The SL Coast Guard also has a website at: http://www.slcoastguard.org/ Both the website and the notecards Chakuu provided stated the organization made a strong emphasis of boat safety. Wonderful article and i could't agree more with Delinda. Went to attend the RL birthday bash they hosted for the US coast guard and met majority of them and they are extremely friendly and fun AND dedicated to helping the grid. BTW the knowledge of the oceans in mainland grid of the SLCG crew is remarkable,they know their stuff!